You should be proud of all the good work that you’re doing to help continue their legacy and make a difference in other’s lives. 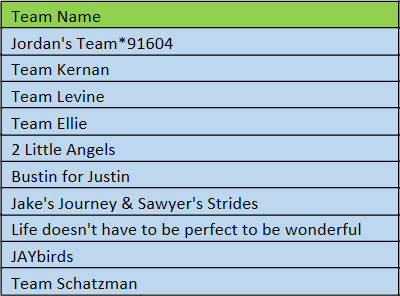 Well done on the high ranking for the March of Dimes teams! That is a family accomplishment! You are making a difference. They are continuing to contribute and help others. That’s so special. I am proud of how you continuously impact others lives in such a positive way. What a legacy for Jake and Sawyer. Sending love.